“Our aim is to enhance technology, and we have a new slogan: Get It Right,” Brian McClimans, newly promoted to the position of vice-president global business development at Peerless-AV, Aurora, Illinois, told us at #dse2014 last week. 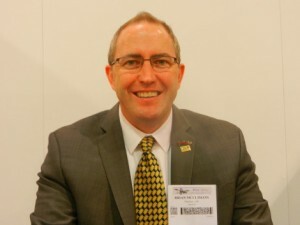 “We’ve been in business since 1941, did our first TV mount in 1964 and then moved into digital signage,” said McClimans. Peerless positions itself as a partner with display manufacturers, to provide easy-to-use solutions while keeping costs down. 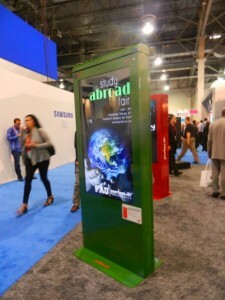 One of several new products that took our eye at the Peerless-AV booth was a new outdoor sign sealed for all-weather. This high, bright sign could well be used in a variety of places – including amusement parks, which is one of the new market areas being explored this year by McClimans. It’s an area where it’s important to reduce the wait time (or perceived wait time) for rides and attractions and one of the ways is for easy-to-use intuitive signage, he said. 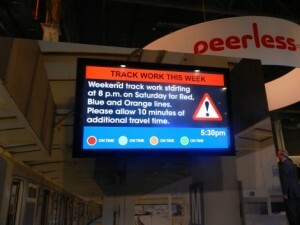 Another digital signage example displayed at the Peerless-AV booth was in the transportation sector, specifically for the operational use of subway trains. These signs provide a variety of information both in terms of safety for the train operators while the public gains information on train arrivals, construction, and other information. Peerless-AV has already deployed them at the Chicago metro transportation stops and at the Washington metro. This entry was posted on Thursday, February 20th, 2014 at 10:00 @458 and is filed under DailyDOOH Update. You can follow any responses to this entry through the RSS 2.0 feed. You can leave a response, or trackback from your own site.